Mariners Latest: Ichiro - Nice Of You To Finally Show Up! Ichiro - Nice Of You To Finally Show Up! Ichiro has been having a sub par season this year. From April to August he hit just .267 with 118 hits. Along way to go from his 200 hit mark and it looked as though the streak of 10 seasons in a row of hitting that mark would be over. As of late, Ichiro has looked more like his usual self. In the month of August he has had two hitting streaks of ten games or more and is currently on a 12 game hit streak. Ichiro is hitting .307 with 35 hits in the month of August and has raised his season average to .275. Still not his best numbers, but they are getting up there. Many have questioned if Ichiro's age is finally catching up to him. At 37 years old, some say he is showing signs of slowing down. In my personal opinion, he has shown signs of complacency in the outfield and has spent a number of games at the DH spot this year. So, with the final month of the season ahead of us and the streak hanging in the balance, many would say that there isn't a shot that it continue. The reality is, it's not impossible. If there is anything we do know about Ichiro, he seems to rise to the occasion when faced with a challenge. As the season winds down and that 200 mark looks near impossible to reach, Ichiro has manned up and started hitting, again. In his current 12 game hitting streak he has a .370 AVG and 20 hits. That gives him a total of 153 hits so far this year and 47 away from breaking Pete Rose's record of 10 seasons of 200 hits or more. Looking back, we know Ichiro is capable of getting 50 hits in a month, but the question is, Is he capable of getting 50 hits in a month at age 37? 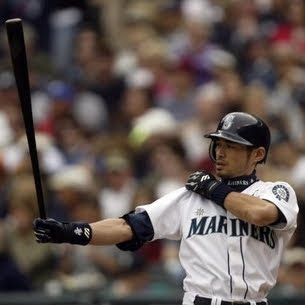 More importantly, if Ichiro comes through with 47 hits the rest of the way out, the question will be, "Where was Ichiro the rest of the season?" In my mind, he gave up this year. The team didn't have it in mind to win this year, so Ichiro didn't have it in his mind to win either. A record however, I think he will chase after that. Which would fall into place with what many say about Ichiro, that he is a selfish player. Some say that he only cares about his personal stats and not about the team. One thing I do know, that just like every professional ball player, Ichiro wants to win.